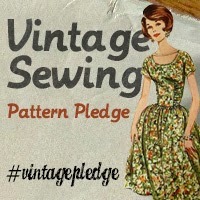 Believe me, all of you amazing sewists, who are showing off your creations for all 31 days this month, I am so impressed & following along avidly. A whole wardrobe of things I've made?! I'll call that Me-Made-Maybe, A.D. 2045 edition! In the meantime, after spending the day running errands, going to yoga, going to the gym, fighting w/ a sewing pattern (which is what I feel like I do about 90% of the time), and needing a shower, I finally took one after we got dinner ready and just before we ate. BTW, We've joined the community garden nearby and our sweat equity has really paid off...the greens & herbs have been abundant, fresh & delicious the last 5-6 weeks. Rainbow chard, beet greens, spinach, every possible variation on lettuce, cilantro, etc. Yum! 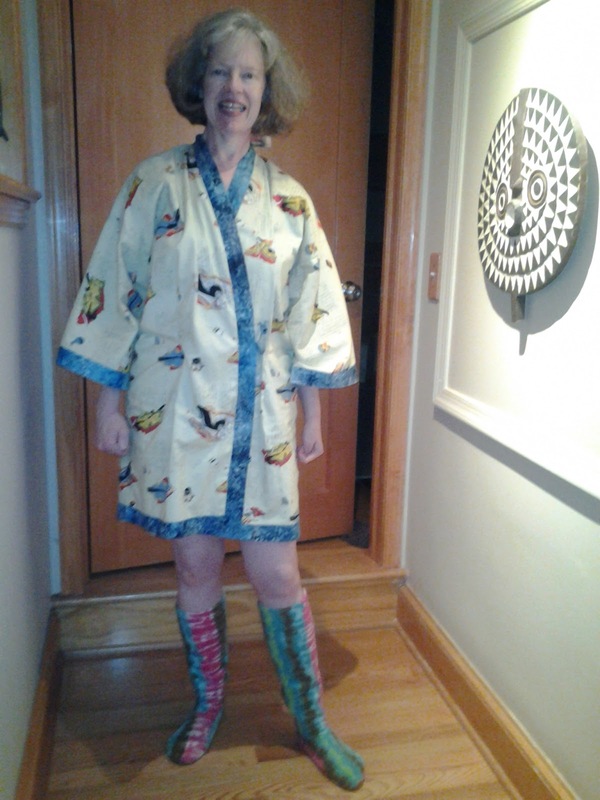 Anyway, we made an amazing salad, and I got dressed and it just so happened that all 3 items I put on were me-made! I'd call that a me-made miracle. 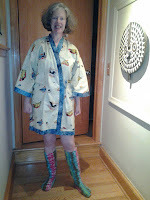 It all definitely came together because it got quite cold yesterday, so I needed the fuzzy slipper-socks, in addition to the nightgown (never blogged) and the hapi-coat (not really a yukata because of the length). 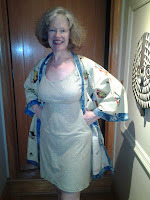 Here are a few photos (sorry they're not the greatest quality), with my own tiny tribute to Me-Made May. Enough Already! 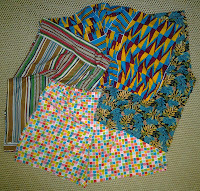 4 Pair of Roommate Knickers! I must admit I didn't figure it out by myself. 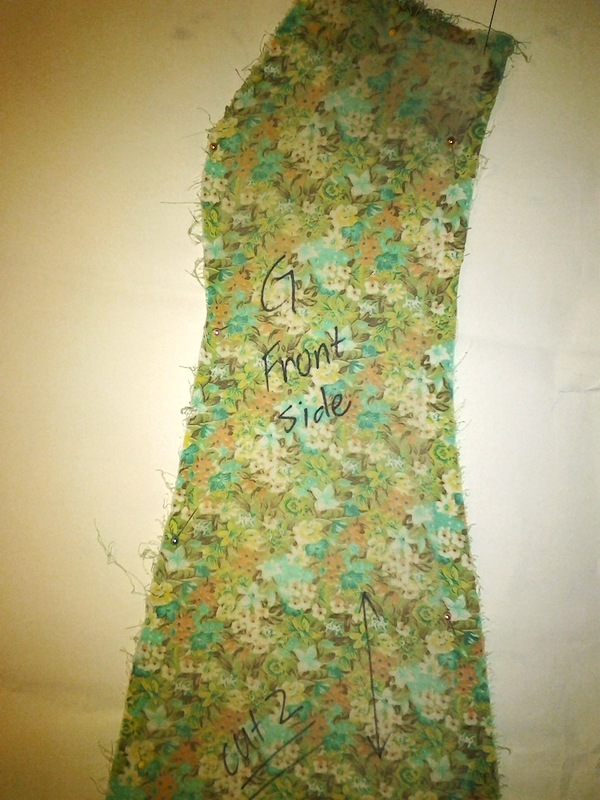 I ended up going to one of the open studio classes at Bits of Thread and getting some assistance from Rosalie, who, despite her tender age, has amazing sewing skills. 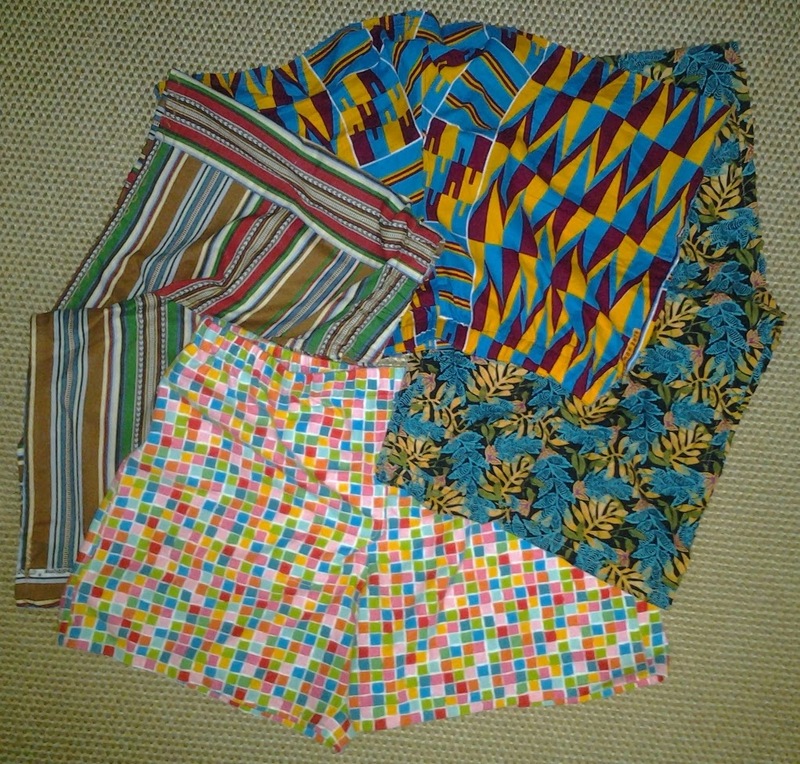 The top pair (turquoise/burgundy/yellow) is using up some of the printed Kente we got in Ghana, lo these many years ago, and the bottom pair is flannel; the other 2 pair are actual one-yard pieces I got at a quilt show. BTW, it's a rainy cool weekend and the Roommate reports the flannel pair were very nice to put on this morning! I have many projects in the pipeline, using some fun fabric I just purchased, plus getting some inspiration from a concert we were at on Thursday...but first I must finish up quite a few things. More on that later! I mentioned I'd found 2 great books in my public library, and ended up buying them both. 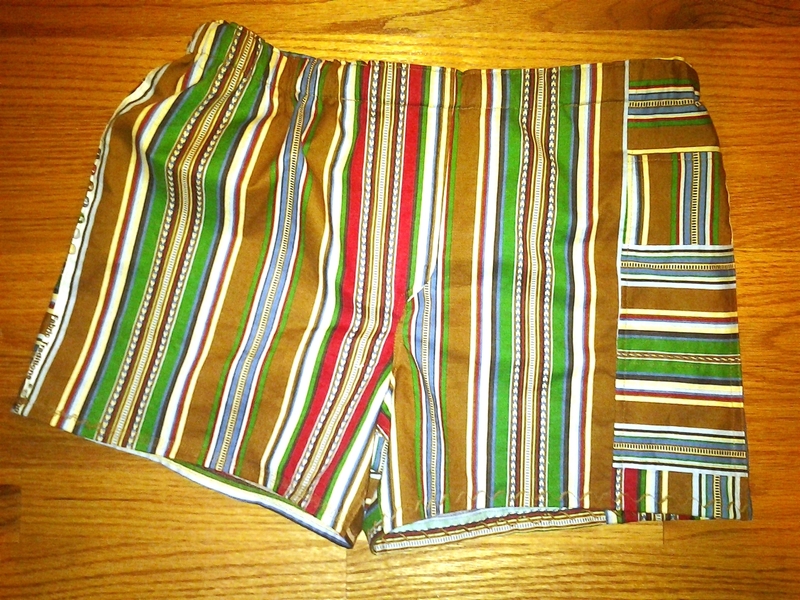 You'll see here the 2nd version of boxers from Fabric by Fabric: One-Yard Wonders, which I actually made with less than one yard! Boy is my life exciting. If you're interested, the original book is One-Yard Wonders. Both are written by Hoskins & Yaker. 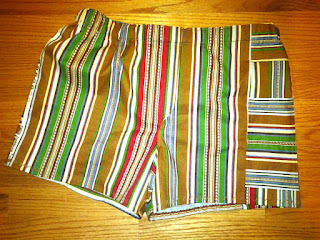 One of the projects was to make a pair of men's pants...something I will probably never try. But they mentioned how difficult a zipper fly is and I remember that I had done a just-barely-acceptable job on the first pair of knickers for Mr. Roommate, so was enthused to try again. The verdict? Well, not quite right, but better. I had a lot of fun playing with the stripey fabric on this & if you look closely at the left edge of the photo, above, you'll see that I went all the way to the selvage. We saw this a lot in West Africa & I think it's a great way to use as much fabric as possible! You may or may not know that the main reason I started making clothes again...and stopped quilting...is because I no longer live in Abu Dhabi & no longer have my tailor, Mohammed, to make clothes for me. 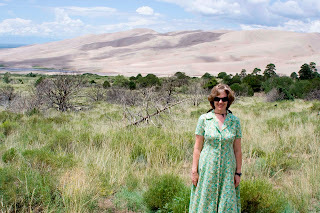 We left Abu Dhabi in 2008, so the wonderful cotton dresses and skirts and jackets I have are beginning to wear out. 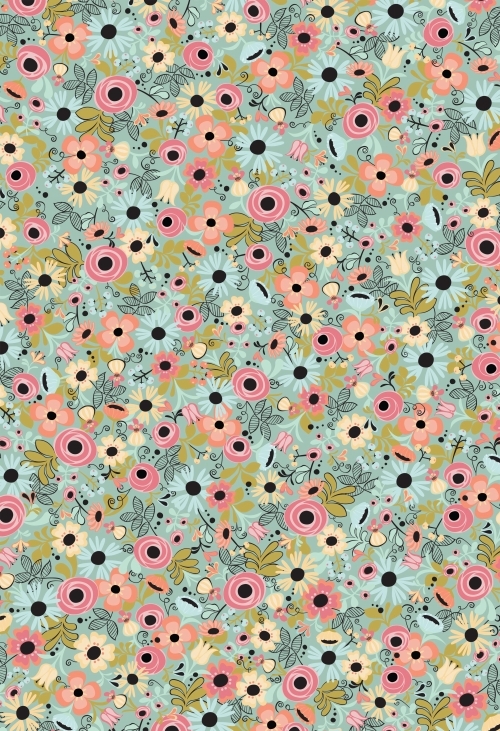 If you're wondering what it will be made of, check out this amazing fabric from Windham Fabrics. I love it & broke down last week and bought 4 yards (there's a discount if you buy more than 3, so I HAD to). them so I wouldn't get confused. The green dress is mostly taken apart at this point--it's quite a good thing to do if you're watching a movie, as we were last night (those old Columbos are great fun!). There were 10 homemade buttons (fabric + plastic) on it and Bella is loving those--they bounce & skitter extremely well on our hardwood floors! 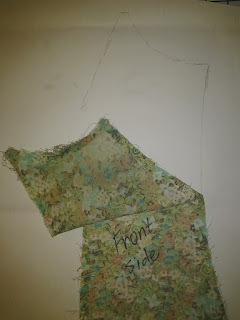 The next part will be turning these dress pieces into pattern pieces. 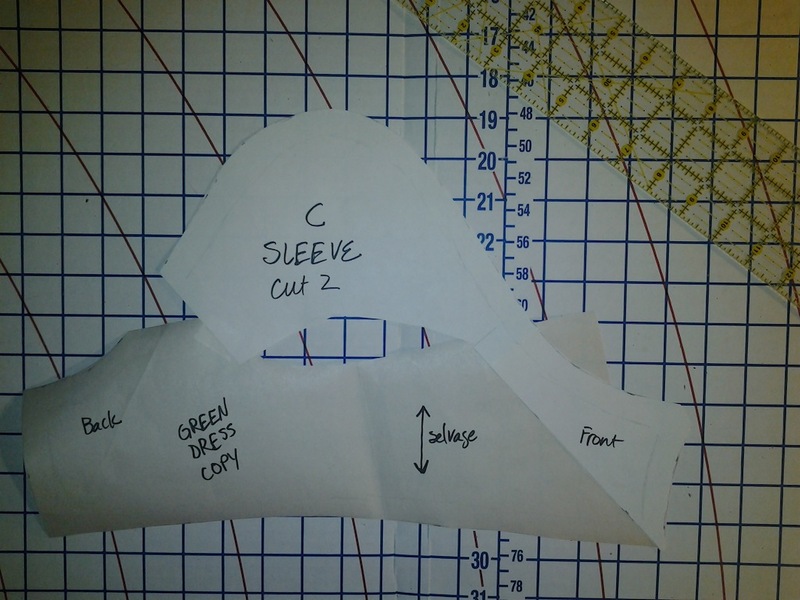 I don't think Mohammed used a 5/8" seam allowance! 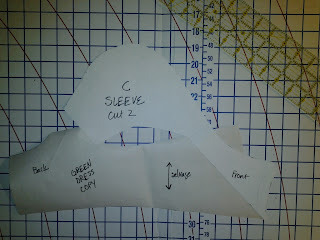 But I have plenty of old maps from work to make pattern pieces out of...so here I go. want to start cutting into a new map! Bella is devoted to Project Runway, too! Overseeing the efficient use of fabric.